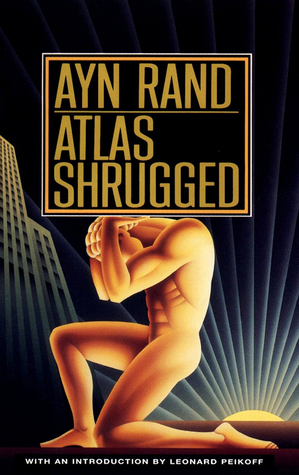 Perhaps the most significant book in post-war American literature, one which has regained popularity since the start of the economic crisis, Altas Shrugged is the embodiment of an ideal society, the ultimate vehicle for Ayn Rand’s philosophy of objectivism. Weighing in at over 1,000 pages of tightly-packed print, it’s also one of the longest novels in English literature. Is it any good? Well, as a novel, Atlas Shrugged unfortunately falls flat, in ways that Rand’s first novel, We the Living, didn’t. There is foremost no humanity in the novel, the characters are dismembered, dessicated mouthpieces to Rand’s philosophical diatribes, with everyone fitting neatly into ‘good’ and ‘bad’ camps. Rand herself claimed that using characters as symbols was never her intention: “My characters are persons in whom certain human attributes are focused more sharply and consistently than in average human beings.” But what we are left with are flimsy apparitions, lobotomised automatons fulfilling the roles required of them to extol the virtues of her philosophy. Even this is taken to extremes, with one of the proponents delivering a 60-page long theoretical speech around which the rest of the novel might well be seen as scaffolding. To complement this set of lifeless characters is a plot which similarly confounds understanding. In an America which technologically resembles the period in which Rand was writing, yet industrially feels set in an earlier period, and borrows heavily from the Great Depression, the main events and the decisions of the characters jar heavily with what the reader knows and expects from society. As another reviewer pointed out, what’s missing is the overt understanding that the story takes place in a parallel world or a different timeframe, to create a genuine sense of credibility. True, there are some hints that push this novel into the realms of science fiction–a super metal alloy, power derived from static electricity, weapons based on sound waves etc.–but the world is definitely our own, even if the people and their decisions are alien. Key to the story is the gradual collapse of the economic system, and the disappearance of the champions of industry. What happens in Rand’s universe when the creative minds of the world go on strike? Apparently, they settle down on the frontier and, working one month a year, create a fully-fledged miniature utopia. Personally, I imagine they’d starve. A bad book can still be a good delivery vehicle for an interesting message. Yet this unwieldy book fails even to achieve the latter. For its mammoth length, Rand’s message could have been relatively concise, but for the plot’s repetitiveness. If you are interested in Rand’s philosophy, there are plenty of other places to turn which will provide a far more succinct and detailed explanation, without the repetition or padding necessary for its delivery in novel form. Whether you find place for Rand’s philosophy in your own, or like Gore Vidal consider it “nearly perfect in its immorality”, there are simply better summaries available. For the converted, this is probably a wonderful book, but for anyone else it simply isn’t worth risking the investment of time and energy. No one can deny this book’s enduring popularity. That alone gives rise to curiosity strong enough to keep it fresh in the public consciousness. But it is a far cry from a great piece of literature, and as an allegory, a philosophical harbinger, its ponderous and verbose nature should have the curious turn elsewhere. The novel opens with the question: “Who is John Galt?” A thousand pages of largely disappointing text will reveal the answer, but you’d be better served just reading the appendix. I don’t make mistakes. I make prophecies which immediately turn out to be wrong.